In Indiana, you’ll find no shortage of excellent ice cream options from old-school parlors to modern shops. 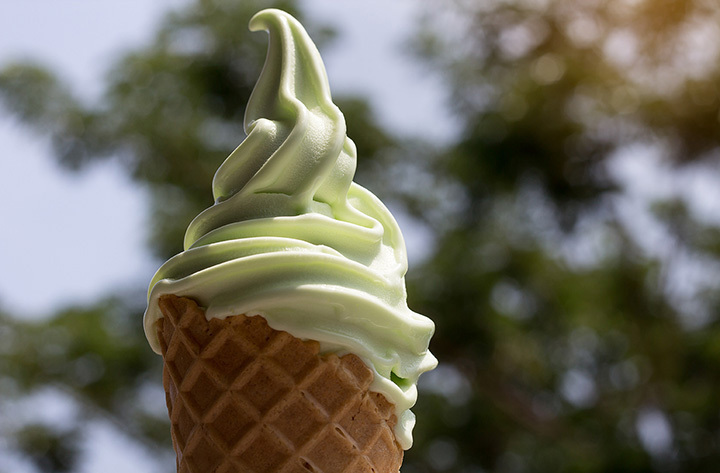 Whether it’s a banana split you prefer, a classic flavor, or a quirky concoction, check out these 10 awesome ice cream parlors in the state! One of the best places in Kokomo for some good, old-fashioned ice cream is Scoops Ice Cream. With two locations to choose from, Scoops has dozens of delicious flavors to choose from. Whether you prefer the classic flavors of chocolate, vanilla, or strawberry, or perhaps something more exotic such as birthday cake ice cream, Scoops is the place for the best ice cream. Not to mention, whether you choose from one scoop, two scoop, or three scoops, Scoops doesn’t skimp on their scoops. If you prefer shakes to scoops, they have some of the most delicious shakes! Graeter’s Ice Cream has been serving up delicious, homemade ice cream since 1870, and is a family owned and operated company throughout the U.S. Made with the finest ingredients, Graeter’s Ice Cream contains no fake syrups or sweeteners, no fake colorings, and no hydrogenated oils (aka trans fats). Their cows are also free of artificial growth hormones, and all fruits included are local, homegrown, and fresh. They also offer low glycemic options as well, which has 50 percent less sugar and 25 percent less fat. Try the mint chocolate chip! Also, highly recommended is the signature chip flavor, salted caramel chocolate chip. Who doesn’t love caramel and chocolate put together? Another place serving up great ice cream is Wyliepalooza Ice Cream in Indianapolis. Patty Timmons and her daughter, Cassandra Salimeno, opened Wyliepalooza in 2013. The name comes from Patty’s granddaughter, who goes by the nickname ‘Wiley’ and is the life of the party, which is what a palooza is. One of the things that makes Wileypalooza unique compared to some ice cream venues is that the ice cream comes in egg free, gluten-free, and soy-free varieties. The ice cream is made with pure ingredients and rich in flavor. Need a caffeine pick me up? Try their delicious Cooky Mint. It tastes just like those amazing Thin Mint Girl Scout Cookies! For the soy free ice cream, try the ultimate Oreo soy! You won’t be disappointed! “I cannot tell a lie. It is simply the best!” Rest assure, your nose will not grow when you talk about how amazing and delicious Pinocchio’s Original Italian Ice Cream is. Pinocchio’s started in Sanibel Island, and has only one other franchised location, which is family owned and operated in Greenwood, Indiana. Pinocchio’s offers ice cream, gelato, frozen yogurt, sorbet and sorbetto. All are made fresh daily, and includes flavors unique to Pinocchio’s, such as Hoosier Hysteria and gelato cupcakes. You know you are at Pinocchio’s by the vibrant colors, in addition to the reclaimed wood wall, which gives the location a bit of history. When you step inside, it feels as though you’ve stepped back into a 1960s ice cream parlor. Located on the original 1928 alignment of U.S. Highway 27, Old 27 Ice Cream Shop is the perfect place to see where time has stood still and to stop and enjoy time with family and friends. Located in historic Decatur, Indiana, this old fashion ice cream shop is reminiscent of another era, when times were simpler. It is also an extremely family friendly joint, where everyone knows everyone and by the time you leave, you’ve made a new friend. Their menu is simple, but everything this shop has to offer is so delicious. Dairy Belle has been in business since 1950, serving up some of the best homemade ice cream in Hammond, Indiana. Everything is homemade at Dairy Belle, and you can also custom order items as well! Their ice cream cakes are to die for, as are their frozen, chocolate covered bananas. The employees are friendly and provide outstanding customer service. Try a delicious, standard ice cream cone of chocolate and vanilla mixed together, or a delicious pineapple shake! BRICS (Broad Ripple Ice Cream Station) is a two-family owned and operated establishment in Broad Ripple, Indiana. Best friends David Vonnegut-Gabovitch (yes, Vonnegut as in Kurt Vonnegut) and David DuBow opened BRICS in 2010 with the goal to provide the Indianapolis community with delicious ice cream, memories and happy times. What makes BRICS unique is that they are committed to being as environmentally friendly and sustainable as possible. For those on the go, they offer compostable cups and spoons! Another thing that makes BRICS unique is that they are open year-round. Come enjoy a delicious scoop during the dog days of summer, or have a seat and enjoy your treat next to the fireplace! The Widow’s Walk Ice Creamery and Bicycle Rentals is a unique gem located in southern Clarksville, Indiana. In addition to the most delicious ice cream one can imagine, there is also a beautiful view. The Widow’s Walk overlooks the Louisville, Kentucky skyline and sits along the banks of the Ohio River. One would almost forget that they are in Indiana, and perhaps in another location down along the waters of Lake Michigan or along the Gulf of Mexico. The Widow’s Walk offers 22 flavors of ice cream to choose from, in addition to the most delicious Quetta’s Dark Chocolate Birthday Cake ice cream one could ever imagine. Head over to the Igloo Ice Cream Shop in Silver Lake, Indiana, for some cool, refreshing, and mouthwatering ice cream. The Igloo is the place where friends gather, and has been a family owned business since 1958, when the original Igloo started. The Igloo offers between 30 and 32 hand dipped ice cream flavors to choose from, and what a choice! The chocolate brownie and cookie dough is particularly scrumptious. For your beloved four legged friends, try the Mindy Cup. Chillers Ice Cream began its journey in 1966, when owners Don and Dottie Rosenbarger decided they wanted to dive into the world of ice cream, and serves up some of the best Vortex ice cream that there is. Like Dairy Queen’s blizzards, the Vortex is a mix of ice cream and candy and is so delicious. From the blueberry vortex to the brownie fudge and M&M vortex, there is a flavor for every preference. They also offer an amazing Oreo Monster smoothie. Feeling nostalgic? Try an orange ice cream float! Need a coffee pick me up? Try the vanilla latte, made with 100 percent Columbian coffee!